Does your dad adore cars? Or did you ever treat him like a taxi when you were younger? (Yep, we are guilty of that too! Good memories eh?) Either way, this fantastic card shape will be sure to ‘wow’ him this Father’s Day! Download our free car shaped template and read on to see how Maxine created this fab look. 1. Print the free template and cut it out. 2. Fold your chosen Dovecraft A4 card in half, line the template at the top and cut out the car. Ensure the car template lines up along the fold of the sheet of card. Use Washi Tape to secure the template to the card, cut out the windows with a craft knife and tape pieces of Dovecraft acetate behind the windows with Dovecraft Perma Fix tape. 3. Choose a paper design from the First Edition Pick n’ Mix 8x8 paper pad, adhere to the inside of the card, at the back and cut off the excess. 4. Use a fine liner pen to add faux stitching along the edge of the car and windows, at the front. Cut two doors out of a complementing Pick and Mix paper design, add faux stitching along the edges and adhere the doors underneath the windows, at the front of your card. Cut out two wheels from a sheet of Dovecraft black card and glue them to the card. 5. Cut out the bumper shapes, inside of the wheels and door handles out of Dovecraft Silver Mirror card and adhere to the car. Cut out a small hand wheel to adhere to the inside of the card, peeping through the window! 6. 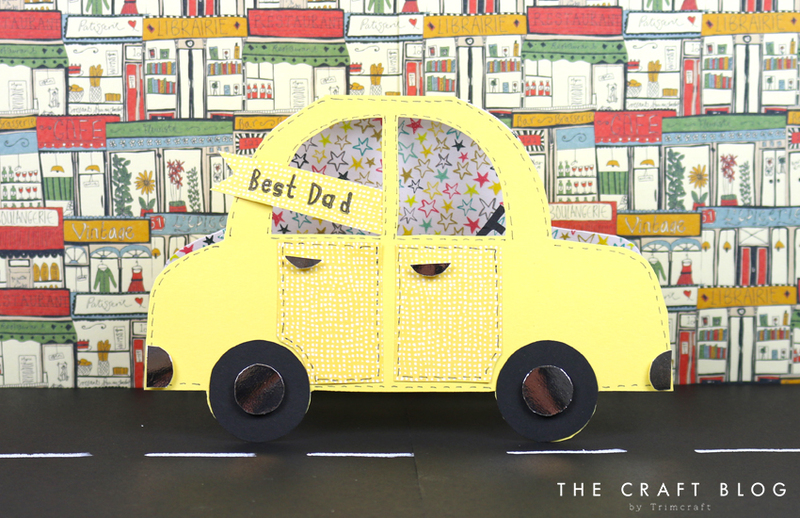 Stamp the words ‘Best Dad’ onto a piece of Pick n’ Mix paper using the Dovecraft Wooden Alphabet Stamps, cut out a flag shape and adhere to the car window. This totally takes card making to the next level! We adore this clever design and better yet, you can change the sentiment to use this card shape for other occasions like Birthdays, passing a driving test etc. How will you use this Father’s day card shape template? Share your projects to the inspiration area and #trimcraft when uploading to social media.